COMMENTARY ON "GRIEVING AND RESISTING THE SPIRIT"
"The Holy Spirit possesses a matchless power to make us overcomers and to enable us to reflect the beautiful character of Jesus. 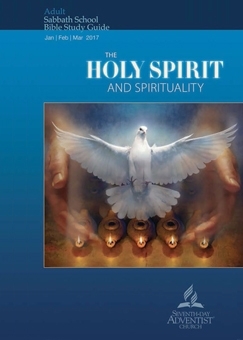 At the same time, this powerful and mighty Holy Spirit can be resisted by feeble sinners. He does not force Himself upon us." Scripture admonishes Christians to not grieve or resist the indwelling Holy Spirit which makes this week's theme an important topic. In Scripture this is normally related to the subject of our ongoing sanctification. The purpose of today's commentary is to restrict our understanding of sanctification to what Scripture actually teaches. All sinners are born sinners. We sin because we are born into the kingdom of darkness. In-other-words it is in our nature to sin. If we could somehow stop sinning we would still be lost in the kingdom of darkness. Adventism simply ignores the existence of the human spirit and that this is what died when Adam (and Eve) sinned in the Garden of Eden. The existence of this dead human spirit found within sinners is what Jesus is talking about when he declared that a sinner must be "born again" before he/she can be transferred out of the kingdom of darkness and entered into the kingdom of God, John 3:1-10. One of Adventism's greatest lies is that Christians (those who prefer to call themselves Adventist) can learn to perfectly "reflect the beautiful character of Jesus" and that this must happen before Jesus Christ can and will return to collect his saints. Scripture does not describe Jesus Christ as having character traits. To apply this expression to someone includes the understanding that a person has both good and bad character traits. Jesus declared "I and the Father are one" (see John 10:30-33) meaning he is and has alway been eternally wholly God with all of the same perfect holy attributes of God the Father. Therefore Jesus' birth and life among fallen mankind could not possibly include having a sin nature nor the possibility that he could sin. Jesus Christ, being eternally equal with the Father (with all the same attributes, not character traits), became our perfect sacrifice for our sin because he did not and never could have sinned. To make the unbiblical claim that Jesus could have ever sinned is heresy. The Apostle John declares that those whose sins have been covered by the blood of Jesus Christ "make him (God) a liar...." if we say we do not still sin. Therefore, not until Jesus returns to collect his saints, will we ever be free from our life of the flesh along with our character traits of sinning. However the promise to the saints is that they will never be separated from the love of God, Rom. 8:18-39. "What are ways we can help others toward “love and good works”? How are you responsible for fostering “love and good works” in others?" Godly “love and good works” is the outworking of the fruit of the Holy Spirit as outlined in Galatians 5:22-23. In-other-words this is the result of God himself working in and through a redeemed sinner. Unless you have personally responded in faith to the biblical gospel message you do not have agape (godly love) nor do you have godly good works because none of this will occur until your human spirit has been born again through Jesus gift of the indwelling Holy Spirit. Only then can you reach out to and share with lost sinners the Good News of what has eternally internally changed in your own life. The "love and good works" that are counted towards a person, as outlined in 1 Cor. 3:12-15, are really the works of Jesus Christ through the indwelling Holy Spirit. Therefore you must place your faith on the finished atonement of Jesus Christ as he is the one and only foundation for the 'works' of a saint of God. To make disciples means to preach the biblical gospel message of the death, burial and resurrection of Jesus Christ for the completed atonement of the sins of the world instead of the failed man-centered teachings of Adventism. In this passage Jesus is speaking directly, face-to-face, with his original followers who had heard and recorded for our benefit what his commands are. For this reason the words of Jesus are traditionally highlighted in red in the New Testament of the bible so we can know with certainty what he said and commanded during his ministry here on earth. Furthermore Jesus will always be with his saints to the very end of this age. They are the ones who have the unbreakable Seal of God which is the Holy Spirit and know they will never be separated from the love of God. Ellen G. White had little or no insight into the truth of Scripture when she declared the lie that there would come a time when the people of God must somehow survive without a mediator. The bottom line is that Jesus didn't command Christians to foster “love and good works” in others. This is the work of the Holy Spirit not ours. Instead, our mission and command given directly by Jesus is to make disciples of all nations which can only be done by delivering the gospel message of the death, burial and resurrection of Jesus for the atonement of the sins of the world. Even that must be done in the power of God, not ours. The lesson references Ephesians 4:30 and asks this question; "What does it mean to grieve the Holy Spirit?" The inescapable conclusion is that those being challenged to not grieve the Holy Spirit are they who have been eternally sealed by the Holy Spirit into the kingdom of God through the shed blood of Jesus Christ. In-other-words the Apostle Paul is addressing the issue of practical daily sanctification. The foundational environment for growing in spiritual maturity (sanctification) is to know that nothing can separate the saints of God from his love with the knowledge that your faith is anchored on nothing but the shed blood of Jesus Christ. While still living in the flesh even the saints of God do sin daily. What grieves the Holy Spirit is when a saint of God doesn't repent of daily sin and thereby grow in spiritual maturity. In this present life sanctification is a growing experience that culminates on 'the day of redemption'. Therefore we are implored to have on the full armor of God as only by and in the power of God are the wiles of the devil defeated. The quarterly lesson introduce the phrase "Three Angels' Messages" which is one of the core Adventist doctrines. Any doctrine that alters the gospel of Jesus Christ (See Gal. 1:6-9) is something that would without question grieve the Holy Spirit. The purpose of this commentary is to show that the Adventist Three Angels' Messages is most certainly something that grieves the Holy Spirit. The first of the three angels comes proclaiming 'an eternal gospel'. It is a call to worship only our Creator God with the understanding that the hour of judgment has arrived, Rev. 14:6-7. It is believed by Adventist that this message is what was proclaimed by the Millerite Advent movement and is what led, in turn, to the founding of Seventh-day Adventism. The the second angel's message is that Babylon has fallen, Rev. 14:8. Seventh-day Adventism teaches that this was fulfilled when followers of the Millerite Advent movement were expelled from the orthodox Christian churches. The third angel's message is a call to reject the mark of the beast and to keep the commandments of God, Rev. 14:9-12. Adventist interpret this to mean the Old Covenant eternal moral law summarized by the 'Ten Commandments'. Adventists fail to understand that all of the first five books of the Bible are "The Law" of this covenant and you cannot separate part of it arbitrarily by calling it God's eternal moral law and then simply pick and choose other laws of this same covenant that you desire to keep or ignore. First there is the question of who is the Remnant as defined by Scripture. Adventism has adopted their own version of what is called Replacement Theology where the promises made to Israel now apply to themselves. That is, they believe and teach that they are the one and only remnant church. This is their supposed justification for applying Revelation chapter fourteen to themselves. The book of Revelation, the prophecy of Jesus Christ (Rev. 1:1) given by an angel to the Jewish Apostle John gives no hint that he has ever abandoned his eternal unconditional promise given to Abraham, Gen. 17:1-13. The Apostle John gives no hint of such a heresy. Revelation 7:1-8, the preaching of the sealed 144,000 Jewish end-times evangelist, must therefore be understood literally within the context of the eternal unconditional covenant God gave to Abraham. God has not abandoned the true remnant of the nation and people of Israel. Those who come before the throne of God in Rev. 7:9-17 from all the world are the result of Jewish evangelism and has nothing to do with the false 'remnant church' theory of Adventism. The 'eternal gospel' of Rev. 14:6 can only be the one and only gospel of Jesus Christ as stressed in Gal. 1:6-9. The work of Jesus Christ for the atonement of the sins of the world at Calvary; his death, burial and resurrection is the complete and only eternal gospel. Since Jesus is the Son of God with all the attributes of God the Father he cannot be in contradiction to his own words. What Jesus revels to the Jewish Apostle Paul concerning the true gospel in the book of Galatians must be the very same truth given to the Jewish Apostle John revealed to us in the book of Revelation. The lesson begins by referencing 1 Thess. 5:19-21 and asks how the Holy Spirit can be quenched? While today's theme passage does express well one of the ways the Holy Spirit can be quenched, this is not the best way to approach the question of how to quench or not quench the Holy Spirit because any Adventist who whole-heartedly believes in the role of Ellen G. White is someone who has been inoculated against biblically and objectively testing her teachings. Specifically you, as an Adventist, have been inoculated with the tendency to pass over and ignore the later part of this passage where we are commanded to test everything. The accepted belief within Adventism is that she defines what Scripture means instead of letting Scripture be the rule of what is truth or fiction. It is sadly ironic for Adventist to ignore the command given in 1Thess. 5:19-21 to 'test everything' in accordance with the instructions given in the Old Covenant on how to test the words of a prophet but not understand that this reluctance to do so constitutes the breaking of the 'eternal moral law' Adventist claim to be keeping. The most significant thing above all other things that the Holy Spirit does in the life of a sinner who responds in faith to the gospel message of Jesus Christ happens when Jesus Christ instantly gives you the indwelling Holy Spirit who instantly brings to life your dead human spirit. If your own dead spirit is not born-again of the Holy Spirit you cannot enter into the kingdom of God. Even though there is much more that the Holy Spirit does in the life of a saint of God there simply is nothing more significant than having a spiritual birth and entry into the kingdom of God, John 3:1-21. Christians certainly are to avoid what is sin. However Scripture does not teach that this happens because of our own potential "power to overcome sin". The Apostle Paul in Romans 7:14-25 makes it very clear that such power does not exist within self. Because of this and knowing that the enemy of all born-again Christians is Satan the devil we are admonished to have on the full armor of God which means knowing and responding in faith to the gospel message, Eph. 6:10-20. Without the gospel and the consequent indwelling of the Holy Spirit there can be no armor of God in your life. And without the armor, the full armor, there can be no victory over sin. In reality your victory can only be Jesus Christ's victory through his shed blood at Calvary. The lesson references Mark 3:28-29; Luke 12:10 & Matt. 12:31-32) and then asks; "If all sins and blasphemies can be forgiven, what is it that cannot be forgiven?" These lesson references teach that God will not forgive blasphemy against the Holy Spirit....period. It is something God has said he will not do. However there is a big difference between saying "will not" from that of saying "cannot". "Will not" is God's sovereign choice in this matter. However God says something much different to those who come to him with 'the faith of Abraham'. To summarize, each of these references declare that; 'all sins and blasphemy except for blasphemy against the Holy Spirit will be forgiven'. Notice carefully that God can and will forgive all sins of those who come to him in faith. So, who is it that utters unforgivable blasphemy against the Holy Spirit? This context of this encounter begins with 'And the scribes' then culminates with 'for they were saying'. In-other-words when the scribes said of Jesus; "He is possessed by Beelzebul," and "by the prince of demons he casts out the demons" they had blasphemed against the Holy Spirit. While this may not fully define what it means to 'blaspheme against the Holy Spirit' what Jesus is saying through a parable is that the scribes had just done such a thing. By their false accusation the scribes were really saying Jesus was demon possessed. Jesus responded by first pointing out that "a kingdom divided against itself cannot co-exist" with both good and evil in it. In these troubled times of ours many are tormented, especially those who have no assurance of their salvation, by the thought that they may be guilty of blaspheme of the Holy Spirit. Be assured that Jesus' atoning death for the sins of the world was a one time event completed at Calvary. Just like the Philippian Jailer (Acts 16:25-34) or the thief on the cross when you a sinner dead in your trespasses and sin come to Jesus in believing faith you will be saved, eternally saved. If Jesus were really working through the power of 'the prince of demons' as claimed by the scribes then the kingdom of God and of all of creation would have suddenly ceased to exist. Such a unthinkable blasphemy could not be allowed to go unchallenged by Jesus the Son of God. All those who come to Jesus in believing faith will be saved. And, those who are eternally sealed by the Holy Spirit can never be separated from the love of God. Therefore the danger of blasphemy against the Holy Spirit is not a warning directed towards the saints of God. For an Adventist however the real question is; Do you know, from what Scripture alone teaches, whether or not your sins have been eternally covered by nothing more nor less than the shed blood of Jesus Christ? "There is, really, only one person God cannot forgive, and that is the person who persistently refuses to come to Jesus for forgiveness. “The sin of blasphemy against the Holy Spirit does not lie in any sudden word or deed; it is the firm, determined resistance of truth and evidence.”—Ellen G. White Comments, The SDA Bible Commentary, vol. 5, p. 1093. “No one need look upon the sin against the Holy Ghost as something mysterious and indefinable. The sin against the Holy Ghost is the sin of persistent refusal to respond to the invitation to repent.” —Page 1093." Of course when Ellen White said "determined resistance of truth and evidence" she was referring to her own writings instead of directing our attention to what Scripture actually teaches. The lesson is talking about those who are unwilling to follow the leading of the current official Adventist leadership. The message includes the thinly veiled threat that those who do drop out may be guilty of blasphemy against the Holy Spirit. As pointed out yesterday, God does not say he cannot forgive sin. With regards to the sin of blasphemy against the Holy Spirit what Jesus did said is that this "will not be forgiven". However Scripture also clearly teaches that all who come to Jesus with the faith of Abraham will be forgiven and transferred out of the kingdom of darkness and eternally placed into the kingdom of God. When Jesus spoke of blasphemy against the Holy Spirit he was not speaking of those who come to him with the faith of Abraham. Adventist members who study this quarterly lesson are being given the message of fear if they dare consider dropping out of the official Adventist organization with the unbiblical teaching that Adventism is the one and only true 'remnant church'. There can be nothing more frightening than to belive you have been damned to the Eternal Lake of Fire with no possibility of repentance. To add to this ingrained fear for those who do renounce their membership they are only officially removed by reason of apostasy. This false teaching is spiritual abuse of the greatest magnitude. Copyright 2017 BibleStudiesForAdventists.com. All rights reserved. Revised March 7, 2017. This website is published by Life Assurance Ministries, Camp Verde, Arizona, USA, the publisher of Proclamation! Magazine. Contact email: BibleStudiesForAdventists@gmail.com.